Facebook launches a version of Messenger – for kids?!? Have you heard this one? 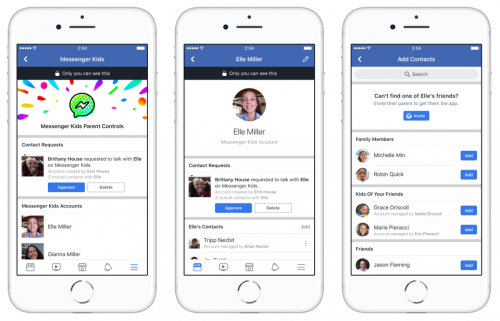 Facebook is launching a Messenger application dedicated to kids ages six to 13. Wait, what? Did you say SIX? Whether it’s using video chat to talk to grandparents, staying in touch with cousins who live far away, or sending mom a decorated photo while she’s working late to say hi, Messenger Kids opens up a new world of online communication to families. Pretty rosy, right? All warm and cuddly. And I’m here to tell you that while those things might happen, 99% of the messaging is going to be between peers, and I am not sure how happy I’d be giving even my nine year old that sort of technology. Let’s talk about all the things that are wrong with this. Since kids under age 13 aren’t even supposed to have Facebook accounts, to use the app parents must download it and then authenticate it with their own account. So Facebook gets a new “customer” by way of the kid, but potentially also a way to get parents who haven’t previously heard the siren song to sign up for an account as well. And Facebook requires you to use the child’s actual name instead of a pseudonym. Let’s just give a passing thought, too, to the potential entanglements of shared custody and parents who disagree about whether their primary school kids should have access to Facebook. But who’s to say that the person giving access to the kid is in fact the parent, or even a real person? Much as Facebook would hate to admit it, it’s not hard to fake up a Facebook account. And then there’s the whole question of Facebook having even MORE data about my family than they already have. They’ve said they won’t serve up ads to the kids, but they haven’t said they won’t be collating the data they collect on our family relationships, or the kid connections, or just about anything else. Sketchy, to say the least. I guess there’s an argument to be made for the fact that kids will be using iMessage or other texting apps already. I just feel like Facebook is promising a false sense of security and control, and while I love using Facebook, I do not trust their motivations. And yet at a time when I’m still struggling to understand how social media is altering my own mind, I’m hesitant to recommend it to children. The benefits of Messenger Kids to Facebook are too obvious, and too little acknowledged by its creators. And the benefits to children all but elude me. I also think that my perspective with relation to my hypothetical six (seriously, are we really talking about SIX YEAR OLDS here?) year old and my actual thirteen year old are a little different. It’s possible that I wouldn’t have gotten my hackles up on this if it were marketed as an app for ages 10 to 13, instead of as young as six. In fact, it’s possible I bent the rules to help my then 11-year-old get an Instagram account, but you can bet I pretty tightly monitored it and that there were a LOT of conversations about responsible use. And as an aside, I find it more than a little funny that both my teens have Facebook accounts that sit idle. There are plenty of streaks happening on Instagram and SnapChat, but I’m pretty sure there are cobwebs on both Facebook accounts. What do you think? Do you share my unease and distaste, or do you think this is a great new way for kids to be able to connect? Or maybe something in between?